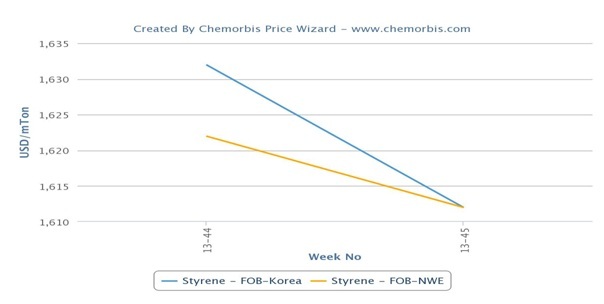 Spot styrene prices moved lower both in Europe and Asia this week, pulled down by sluggish demand and the softer energy markets as per the pricing service of ChemOrbis. Crude oil futures on the NYMEX remained below the $95/barrel threshold on November 8 after posting a fifth consecutive weekly drop last week. In Europe, the spot styrene market remained on a downward note following the lower November settlements and slumped by $65/ton on an FOB NWE basis compared to last week. Spot prices are now standing around $120/ton below early October levels. Rising supply levels were cited as the main reason behind these decreases. Operating rates were higher at many styrene facilities across the region owing to better production margins while some sellers reported that demand for styrene is muted for now due to sufficient supply on the part of many buyers. 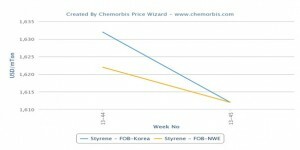 Spot styrene prices in Asia lost ground both on FOB South Korea and CFR China basis this week. Prices were down by $20/ton on an FOB South Korea basis and by $15/ton on a CFR China basis. When compared to early October levels, spot prices are suggesting notable decreases of $130-140/ton in both regions. Slower demand from the downstream markets was cited as another factor weighing down styrene prices besides weaker crude. According to ChemOrbis, South Korea’s Kumho Petrochemical reduced the operating rate of its 250,000 tons/year ABS plant at Ulsan from 100% in October to 60% in November due to weak demand for ABS and poor margins. South Korea’s Cheil Industries is also planning to trim the operating rate of its 600,000 tons/year ABS plant at Yeosu from 90% to 85% in the middle of November. Market sources cited negative margins and stagnant demand as the main reasons behind the company’s plans to lower run rates.